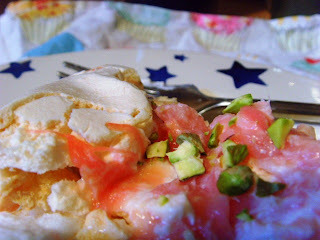 I promised you rhubarb pavlova. And I would never break a promise. Here it is in all its meringuey, creamy, rhubarby glory. I've been having a bit of a love-affair with rhubarb of late, this being my third rhubarb related post in as many weeks. Well, forced rhubarb is something to be celebrated. A glimmer of colour in a season otherwise weighed down with roots, roots and more roots. Not that I don't love roots, you understand. But it is nice to have a bit of colour. Don't you agree...? Pavlova is one of my favourite dinner party puddings. Almost everyone likes it. You can make the meringue in advance. And you can keep it seasonal by topping the cloud-like base with whatever fruits are in season. What's not to like? It is also one of the few pudding recipes that I can whip up without consulting my recipe book - I know that to each egg, I should add 2 ounces of caster sugar. How easy is that? I usually make this in the summer with red berries - strawberries, raspberries and redcurrants. But you can really choose anything. Slightly tart fruits are best due to the sweetness of the meringue - kiwi, pomegranate or passion fruit are great choices. 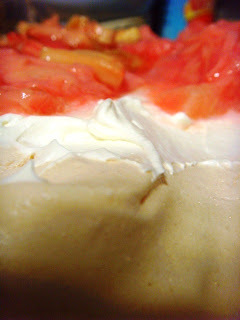 Pavlova is a dessert that hails from New Zealand and was named in honour of Russian ballerina Anna Pavlova. The idea is that the meringue should have crisp outside and a marshmallow-like interior - they key to achieving this is the addition of cornflour and vinegar. Unlikely, it may sound, but trust me on this! 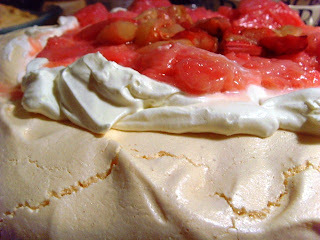 I'd never tried topping a pav with rhubarb, but I thought the tartness would work well, to say nothing of the pretty-in-pink colour. 1. Start the meringue the night or at least 3 hours before. Pre-heat the oven to 150C. Whisk the egg whites in a whistle-clean bowl until stiff. You should be able to turn the bowl upside down without the whites falling out, but you may not want to try this! 2. Mix the cornflour with the caster sugar and whisk into the egg whites a little at a time until the mixture is glossy. At the last minute stir or whisk in the vinegar. 3. Next you need to form the base. Ideally one of those brilliant non-stick sheets of black teflon type stuff is just the thing. If not, greaseproof paper on a large baking tray will do! 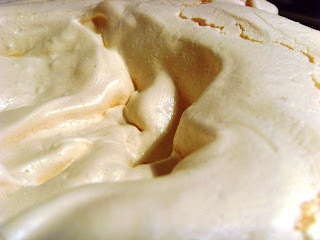 Spread the meringue mixture out on the sheet in a rough circular shape - with a spoon try to make a depression in the centre. Take a skewer and swirl around the edges to create peaks. It doesn't have to be perfect - a rough messy shape is perfect. If you have a very stiff mixture, you could get all excited and pipe it in artistic fashion, but really, life's too short, if you ask me. 5. Whilst it is in the oven, get your rhubarb on the go. Chop into 2cm pieces and pop into a saucepan. 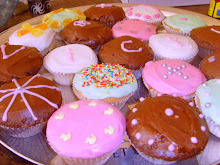 Sprinkle over a ramekin full of water and a tablespoon or two of sugar. Stew on a low heat for soft but not too squishy. 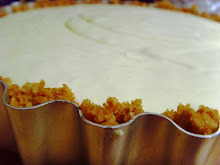 Taste and add more sugar if needed - you want it reasonably tart. Drain with a sieve and retain the juices. Chill the rhubarb. 6. 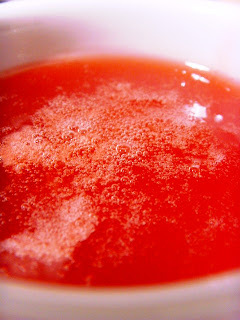 Make a little rhubarb syrup with the juice - pour into a small pan, add a little more water if you haven't got much and another tablespoon of caster sugar. Heat and bubble to reduce until syrupy in consistency. 8. 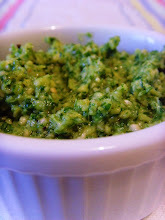 I had this lovely idea of sprinkling over some chopped pistachio nuts. I forgot. Until the next day, when I was polishing up the leftovers. The idea was a purely aesthetic one - I love pink and green together. Beautiful! 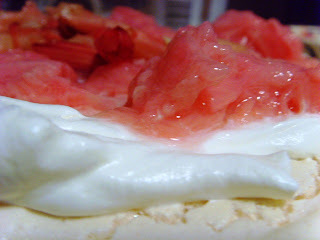 I clipped a recipe for rhubarb pavlova recently but haven't made it yet. If I'm honest I've never had any luck with meringue before so I'm a bit scared! I do need to start utilizing rhubarb more often. 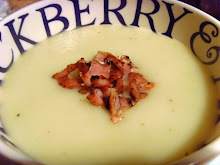 I understand that rhubarb also lends itself well to savory cooking but have yet to try it. Interesting about the cornflour and vinegar. Must work because your pavlova looks perfect! Kai - thanks for stopping by. Cumbled chocolate flake sounds divine as a topping! Yes - I hear that there is a lot of 'debate' between Australia and NZ as to where pavlova was invented - I'm definitely happy to side with you. And it wikipedia says so, then it MUST be true! Ginger - do have a go! 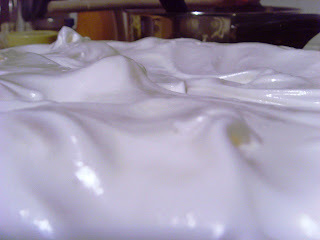 I've used this recipe for the meringue base so many times and it has never failed me. Just make sure the bowl you whisk the egg whites in is clean and that you bake on a low temperature. And don't miss out the cornflour or vinegar! Sylvie - wish I could send you over a slice! 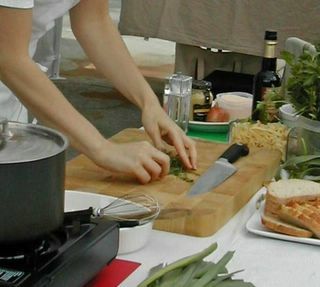 Lisarene - yes, I've never tried it in savoury cooking either, but have seen a few recipes that do so. The cornflour and vinegar are really important to ensure the marshmallow-like interior. Val - ooh - home-grown rhubarb. That will be such a treat! I have been doing a lot with rhubarb lately too, only my efforts tend to have less beautiful results. This is inspiring! Oh this is beautiful Antonia! I have some rhubarb just coming up in the garden and your pav would just be a treat to use it on later. 'Blobbable' I LOVE that word. It's soooo apt. Mmm ... rhubarb! Sounds delicious. Maybe this'll spur me to try more rhubarb recipes. I too am a pavlova girl. The rhubarb looks stunning. I've got some stems in my garden and they look so pretty. 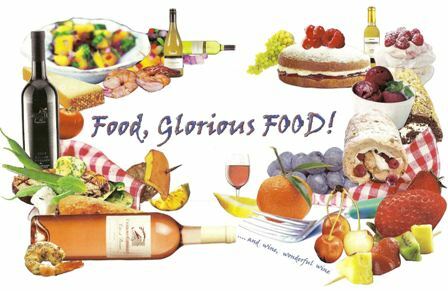 Happy 'Birthday' to Food, Glorious Food!